← Is The Paleo Diet Becoming Mainstream? Does exercise help reduce blood sugar levels in Type 2 Diabetics? Of course! But notice that most of the links you’ll find on this topic stress ‘moderate’ exercise – walking, cycling, swimming, etc. What about higher intensity exercise like lifting weights? I am a type 2 diabetic who is controlling my blood sugar levels without medication by staying on a low carb, high protein/fat diet similar to the Paleo diet and employing a moderate exercise routine. I’ve been successful at this but about a month ago I tore my left calf muscle so I decided to perform an experiment to determine how exercise (and specifically high intensity exercise) affects my blood sugar levels. Prior to my injury I ran and rode my bike for cardio/endurance exercise but I would not call those workouts high intensity. A few times a week I ran 3-5 miles at about an 11 minute/mile pace and once a week I rode a bike for 1-2 hours at about a 14 mph pace so I’m not threatening any world records here! I occasionally lifted weights but this was extremely low key, lasted only about 15 minutes and never happened to the point of strain (high reps of light weights). So here is how I designed my experiment. For about 2 weeks after my calf injury I quit exercising entirely – no cardio/endurance and no light weight lifting. Then for a week after that 2 week layoff from exercising I lifted high intensity weights every day. My definition of “high intensity” – I lifted weights for about 45 minutes and instead of high reps/light weight, I employed low reps/heavy weights to the point where my heart rate was elevated and I definitely broke a sweat. I focused mainly on upper body lifting due to the calf injury but I included some fairly intense abdominal workouts as well. 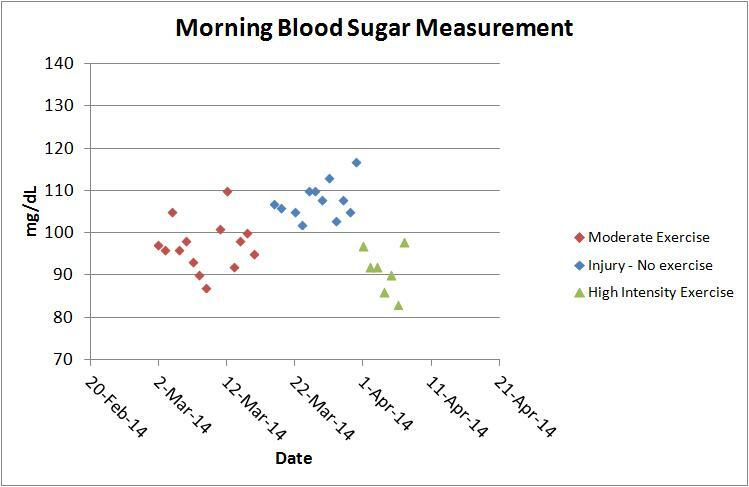 The following graph compares my morning blood sugar measurements for the three time periods – Red is when I was exercising moderately, Blue is when I eliminated exercise and Green is when I incorporated high intensity exercise. And it should be noted that my diet never changed during these 3 periods and the only variable I manipulated was exercise. To be honest, I was very surprised by these results. I knew that exercise lowers blood sugar but I had no idea how much of a benefit I would see from just doing high intensity weight lifting. My experiment not only confirmed that even moderate exercise lowers blood sugar levels but also that high intensity exercise drastically reduces blood sugar levels. You’re living it! And teaching us all!